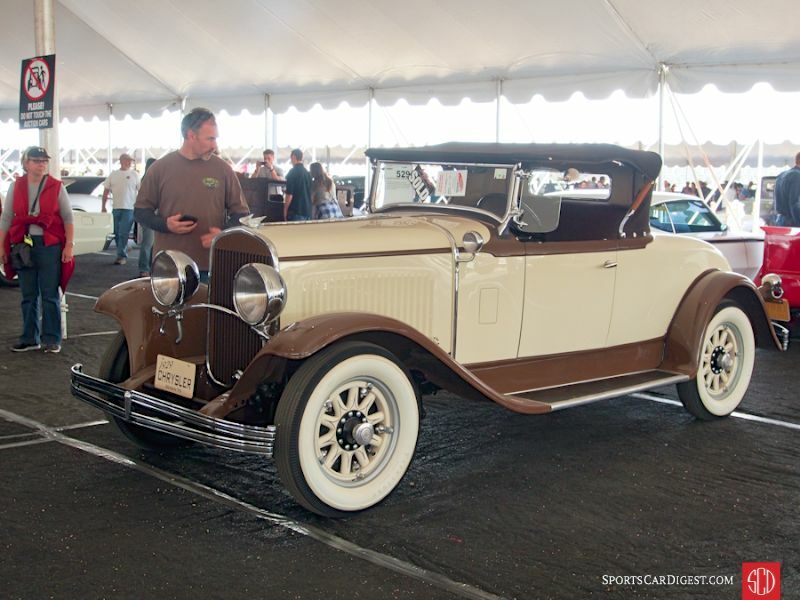 Using the word ‘usual’ about Barrett-Jackson’s Scottsdale auction is never appropriate. Craig Jackson and his staff always succeed in coming up with new, wonderful attractions, events, demonstrations and even a large docket of vehicles to cross the block. This year’s Barrett-Jackson ran nine days, from Saturday the 23rd of January through Sunday the 31st. The first two were exhibition days open to the public at reduced prices. Monday saw a full day of Automobilia on the block. Vehicles began their parade on Tuesday and went right through the following Sunday in a steady stream that challenged onlookers’ stamina. The docket itself was down from last year’s amazing offering of 1,628 vehicles to a more sensible 1,490, a number in line with but still ahead of 2014’s 1,403. The $102,423,750 sale total similarly was down from the 2015 record (bolstered in large degree by Ron Pratte’s collection) of nearly $131 million. The average transaction also was down, but the median was 6.1% higher than last year as the caliber of the vehicles offered skewed slightly better. 99.5% of the vehicles offered were sold, a performance that is consistent with the prior four years since Barrett-Jackson began taking a few high end cars in the Salon section with reserves. The Barrett-Jackson Automobilia auction, whose numbers aren’t included here, has gone for an auction day morning diversion to warm up the crowd to a full-blown production taking up all day Monday and adding to its total on each of the following auction days. The prices are in many cases eye-opening and the total reaches close to, if not over, eight figures. Automobilia’s increasing contribution is part of the evolving Barrett-Jackson crowd pleasing format. All the numbers are below, but what the numbers don’t tell is the ever-expanding consumer displays by vendors and sponsors that fill acres of the covered display area and even more acres outside. And nothing is inexpensive, least of all entry to Barrett-Jackson which on Saturday lightened day-trippers’ pockets by $75 a head. There is plenty for the derided ‘1%’, but most of the product and service offerings are affordable and accessible to those of moderate means, like the median of $47,850 for the cars crossing the Barrett-Jackson block. It’s a celebration of consumption that makes a mockery of politicians’ harping on a ‘hallowed out middle class.’ Silicon Valley millionaires aren’t buying the spangled clothing, video games, ski boats, telescoping flag poles and massaging lounge chairs on display, or rising to the appeal of the huge Ford, Chevrolet and Mopar new car exhibits. Investment advisors and gold coin vendors aren’t trolling the crowd expecting to find eight- and nine-figure clients. There were some great cars at WestWorld, and even more good ones. The bidders kept their wits about them (for the most part) paying honest prices for sound cars and turning up their noses at those that didn’t measure up. 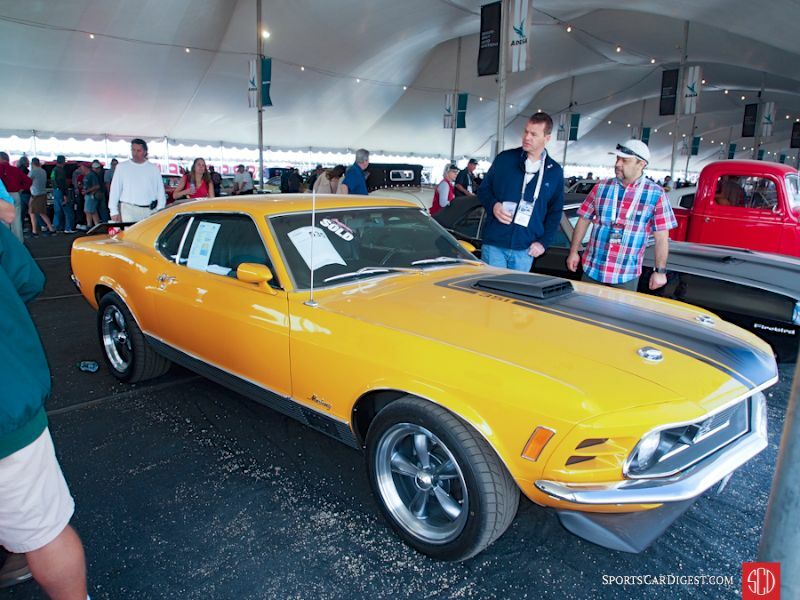 Mid- to high-$40,000 cars is Barrett-Jackson’s sweet spot, the same as it is for the collector car market as a whole, a consignment strategy that Craig Jackson, Steve Davis, Gary Bennett and the Barrett-Jackson crew have developed to a high art form. On-site observations by the editor, Andrew Newton, Greg Ingold, Tim Weadock and Chris Winroth; final edits and comments are the responsibility of the editor. Lot # 0154.1 1954 Ford Crestline Victoria Convertible; S/N U4PV121061; Torch Red, Sandstone White roof/Red, White vinyl; Older restoration, 3+ condition; No Reserve; Hammered Sold at $20,000 plus commission of 10.00%; Final Price $22,000 – 239/130hp flathead, overdrive 3-speed, hood ornament, wire wheel covers, whitewalls, overdrive 3-speed, bench seat, column shift, radio, dash clock, heater. – Fresh out of long term collector ownership. Several small touched up chips on and around the nose. Decent but slightly faded older paint otherwise. The “Overdrive” badge on the tail has broken right down the middle of the second “r”, so the last three letters hang down freely. Good chrome. Very good interior. Tidy but not highly detailed underneath. An honest older restoration that has shortcomings but is pretty enough to be enjoyed. – Offered at Mecum’s Anaheim auction two and a half months ago where it didn’t sell but hammered at exactly the same amount. It is right on the money for a driver quality Crestline Victoria Convertible and is a transaction that both parties can walk away from without regret. 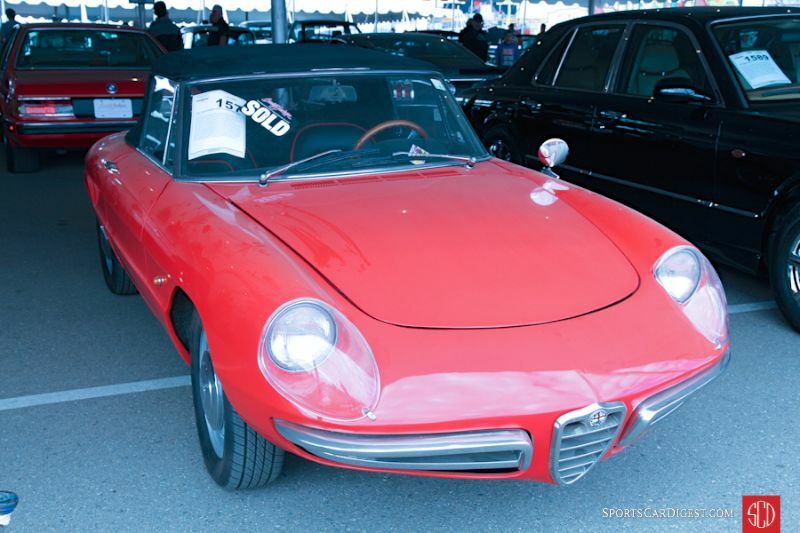 Lot # 0157 1967 Alfa Romeo Giulia Duetto Spider, Body by Pininfarina; S/N AR664115; Carmen Red/Black vinyl piped in Red; Black cloth top; Enthusiast restoration, 3+ condition; No Reserve; Hammered Sold at $25,000 plus commission of 10.00%; Final Price $27,500– Dual Webers, steel wheels with hub caps, Mastercraft tires, Nardi woodrim steering wheel, Blaupunkt radio. – New chrome. New thermostat master cylinder. Rebuilt engine and gearbox with new clutch, new brakes, new tires, brake hoses, new tail lights. New interior. Restored gauges. Used tidy engine bay. Chrome is not new, or at least not good. Good, sound, shiny older repaint. Trunk doesn’t fit flush. Top is a little worn. Very good, lightly worn interior. Never fully done over, just gotten major stuff intermittently. A pretty driver, done up for the auction to mediocre standards and nothing serious. – Even an ‘ordinary’ Duetto Spider is an extraordinary car, but this is an ample price for this one’s condition. 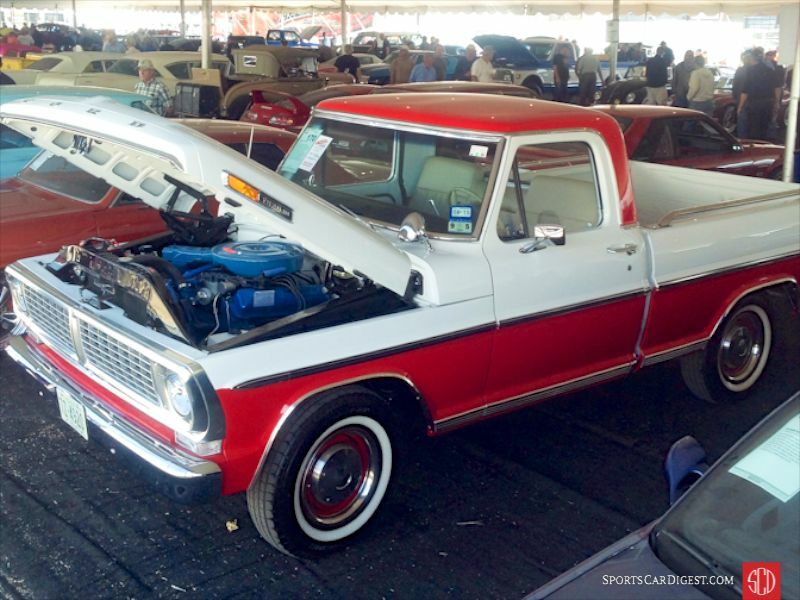 Lot # 0170 1970 Ford F-100 Sport Custom Styleside Short Bed; S/N F10YRH14960; Red, White/Tan vinyl; Truck restoration, 3 condition; No Reserve; Hammered Sold at $20,000 plus commission of 10.00%; Final Price $22,000 – 360/215hp, automatic, hub caps and trim rings, narrow whitewalls, bench seat, column shift. – Body panels are very slightly wavy, but the gaps are all even. Overspray drips on the hood. Bumpers are bright. Some scratching and age haze to stainless trim. Engine compartment fully restored and well cared for with no leaks, but the water pump paint does not match the engine. Fully restored underbody but the painted exhaust is flaking. Seat is of newer design but looks great. Several chips throughout the painted portion of the interior. A truck quality restoration that’s seen some use. – VIN is correct for the desirable 360 V-8 under the hood and the restoration leaves only a little to be desired in a dual purpose, attractive truck. The price it brought is entirely appropriate to its specifications and equipment. 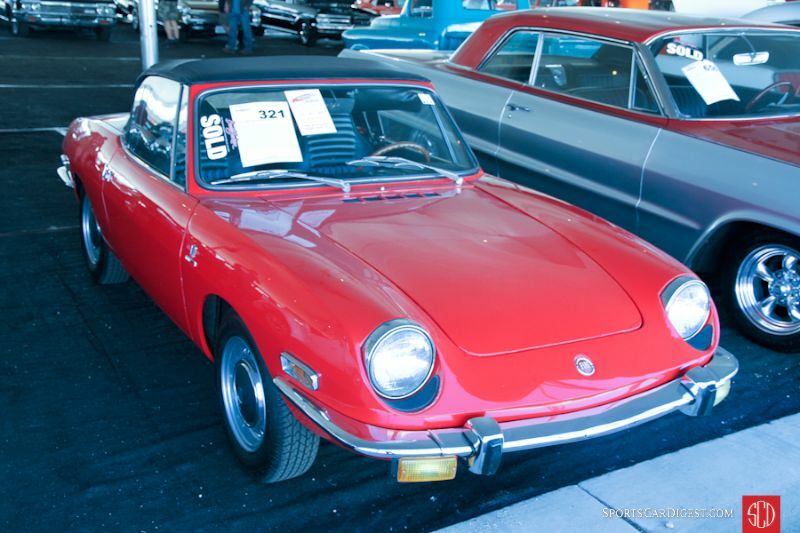 Lot # 0321 1971 Fiat 850 Sport Spider, Body by Bertone; S/N 100GBS10077183; Red/Black vinyl; Black vinyl top; Enthusiast restoration, 3+ condition; No Reserve; Hammered Sold at $10,500 plus commission of 10.00%; Final Price $11,550 – Steel wheels with hub caps, store brand radials, woodgrain instrument panel and glove box. – Small scratch at the front of the driver door and on the right rear fender. Driver’s door doesn’t fit flush. Otherwise very good recent paint and chrome. Very good, barely worn interior. Shabby older top with several small rips and a dirty, foggy plastic rear window. Very good, undercoated chassis and clean underneath. Is it done to concours standards? Of course not. It’s a 1970s Fiat. Compared to the many ratty, rusty 850 Spiders there are out there this one has gotten the royal treatment. A basic restoration finished by Classic Showcase after a previous cosmetic restoration. – A fun if not exactly fast little Italian classic driver with no obvious needs going for this kind of money is reassuring to those of us without particularly deep pockets. This was market price for an example in this condition, which in the world of old Fiats means it’s one of the better examples of its kind out there. 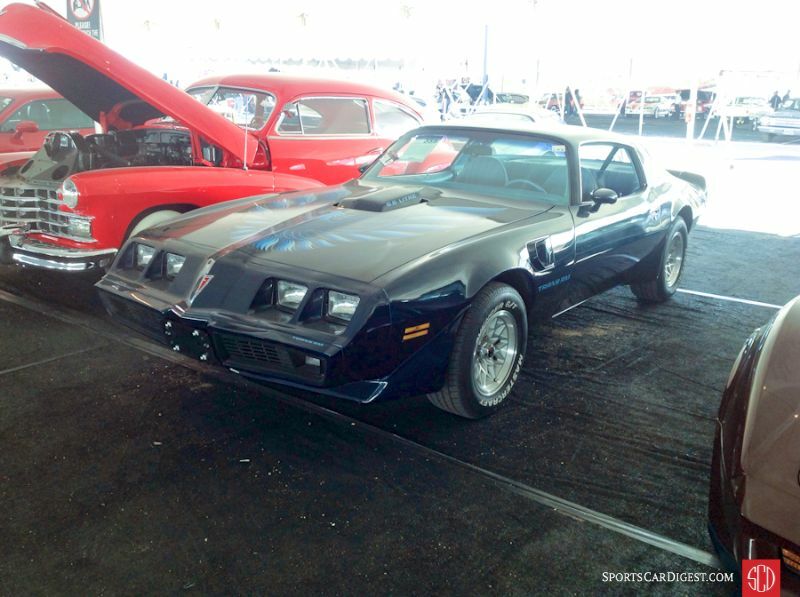 Lot # 0359 1979 Pontiac Firebird Trans Am Coupe; S/N 2W87K9N137767; Nocturne Blue/Light Blue cloth; Enthusiast restoration, 3 condition; No Reserve; Hammered Sold at $10,000 plus commission of 10.00%; Final Price $11,000 – 403/185hp, automatic, 750cfm Holley carb, Edelbrock intake, shift kit, ceramic coated headers, Flowmaster exhaust, snowflake wheels, Ram Air shaker flap, modern stereo. – Fresh repaint in Nocturne Blue. Road rash visible on the front spoiler, behind the driver’s side wheelwell and door. Car card states the interior was restored, but the seats and carpet are significantly faded and passenger side seat has several spots where the material has worn thin. The steering wheel and dash are lightly scratched and dull. The trim and body seals are in very good shape. The original engine has been rebuilt and is fitted with performance mods. – A lot of work has been done to this Trans Am, but little if any of it adds to its appeal to most collectors and its condition is, overall, indifferent. If the interior has been restored, as the car card states, it was a long time ago. It brought an appropriate price for its condition and modifications. 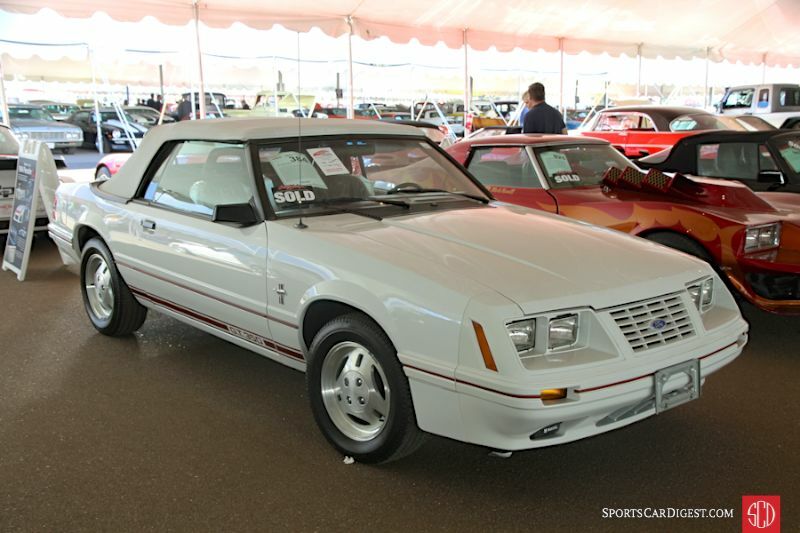 Lot # 0384 1984 Ford Mustang 5.0 GT Convertible; S/N 1FABP27M3EF179654; Oxford White/Canyon Red cloth; White vinyl top; Unrestored original, 2 condition; No Reserve; Hammered Sold at $65,000 plus commission of 10.00%; Final Price $71,500 – 302/175hp, 5-speed, Michelin TRX tires, power steering, power front disc brakes, limited slip, factory air conditioning, power top, AM/FM cassette stereo. – Unrestored with 101 miles and the plastic still on the front seats. A few light scratches on the wheels. Otherwise this car is as new. Rare in that it’s a GT350 convertible and a 5-speed car. Even so, the fact that someone would mothball a car like this for so long is shocking, and so is the fact that so many people seem to have mothballed 80s pony cars. – It may say ‘GT350’ on the side stripes, but it doesn’t say ‘Shelby’ on the hood. Putting it away for 32 years brought a seemingly handsome return, until it’s discounted. It’s less than 5% per year without taking into account storage and insurance costs and the service it took to wake it up. It’s better than investing in Tyco Labs, but not Berkshire Hathaway. The seller hit a home run out of the park with bases loaded in the bottom of the ninth. This is fantastic money. 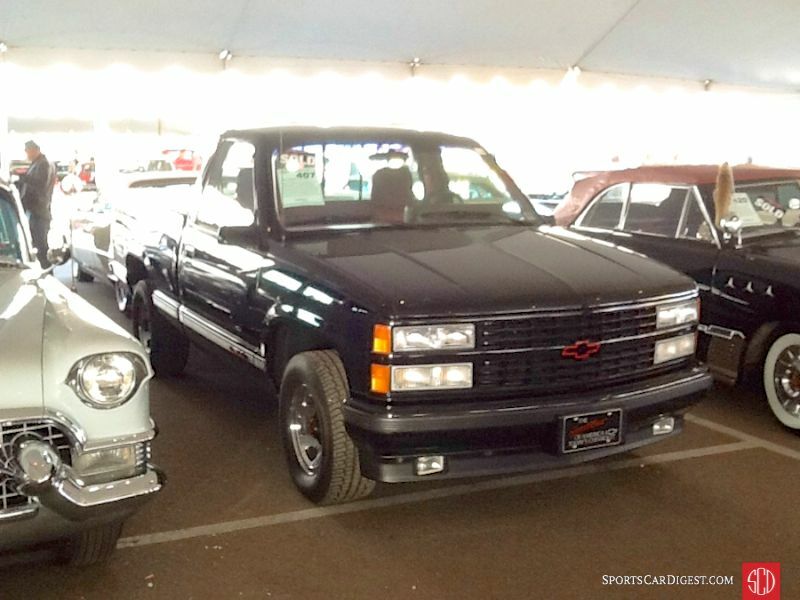 Lot # 0407 1990 Chevrolet C1500 454 SS Pickup; S/N 1GCDC14N7LZ190772; Black/Red cloth; Unrestored original, 2 condition; No Reserve; Hammered Sold at $31,000 plus commission of 10.00%; Final Price $34,100 – 454/230hp, automatic, air conditioning, bucket seats, console, cassette player, power steering, power brakes. Full documentation including the original window sticker, brochures and even the plastic shipping seat covers. – 2,098 miles from new and all original. Flawless paint and graphics, clean mechanicals with minor surface rust on bare metal parts from storage. The interior is practically unused. To all intents and purposes totally original, carefully preserved and in showroom condition. 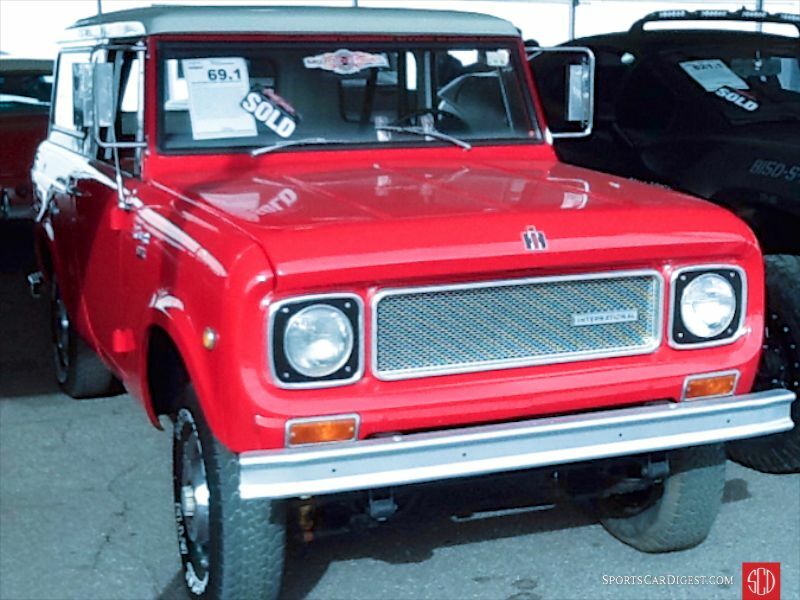 – Sold at Auctions America’s Auburn Fall four months ago for $20,350 showing seven fewer miles on its odometer. 1990 was the 454 SS’s first year, and by far its largest production at almost 14,000. Even in this carefully preserved original condition it is not particularly rare and this is a huge price for one. Lot # 0529 1929 Chrysler 75 Roadster; S/N 253074; Tan, Brown fenders and accent/Brown leather; Brown cloth top; Older restoration, 2- condition; No Reserve; Hammered Sold at $38,000 plus commission of 10.00%; Final Price $41,800 – Body color wood spoke wheels, wide whitewalls, rear-mounted spare, rumble seat, wind wings, Depress Beam headlights, folding windshield. – Good, paint, interior and top. Major chrome is good but the windshield and top frames are thin and pitted. Good instruments and dashboard but the odometer numbers need to be redone. Orderly restored chassis and engine show a little age. A quality older restoration holding up well, a good tour car in dour colors. – A solid result for a sound and solid car. It’s not a CCCA Full Classic ™, which limits the activities in which it can be used, but it’s a lot more car than a Ford, for not a lot much more money. Lot # 0535 1970 Ford Mustang Mach 1 SportsRoof; S/N 0F05M127390; Grabber Orange, Black hood stripe/Black vinyl; Modified restoration, 2 condition; No Reserve; Hammered Sold at $40,000 plus commission of 10.00%; Final Price $44,000 – 351/300hp, automatic, shaker hood, aftermarket stereo, 17-inch Torque Thrust style wide rim wheels, power brakes, aftermarket air conditioning, Edelbrock 4-barrel, rear window slats, wing, air dam, Autosound stereo with major speakers. – Very good paint, chrome and interior. Underbody is like new. Modifications add to drivability if not to collectability but are for the most part easily reversible with included original parts. – The price might be generous from a strict collector’s point of view, but as far as usability goes they add to the car’s appeal. That’s an important inducement here at Barrett-Jackson and the price reflects the standards of this venue. 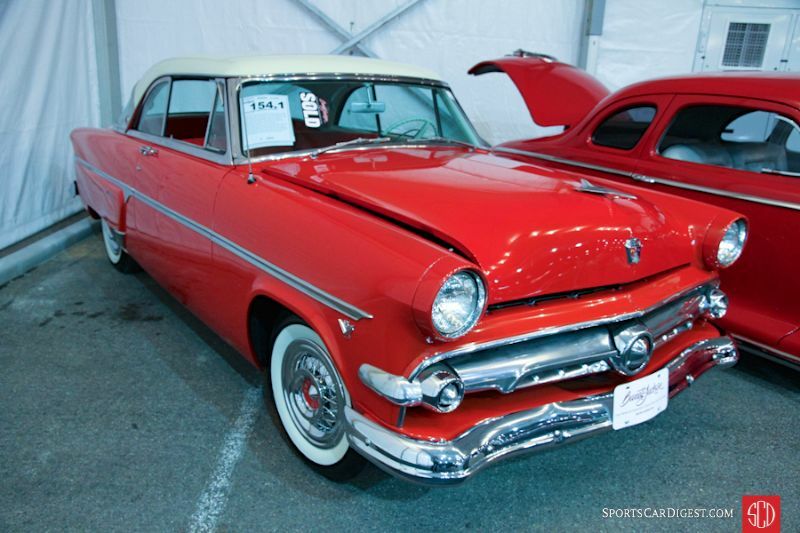 Lot # 0154.1 1954 Ford Crestline Victoria Convertible – Sure looks, like a hardtop to me! Can I get away with the excuse my local hospital offered when they billed me $900 for a $13 blood test?